When discussing cut and sew sweaters, I spend most of my time talking about sewing sweater knits. The cutting part of “cut and sew” gets far less time on this blog. It is, however, an important topic. For some people, especially those with knitting experience, cutting is the part that can be filled with fear. Knitters, having prior experience with dropped stitches, often get worried that runs will form in the fabric. To get past that, I recommend you test the limits of the fabric before you start your project. Cut a 6” x 6" square of your sweater knit and try to make it run. Give it a really good stretch lengthwise and crosswise and notice what happens. If the fabric does run, make a mental note of how much you had to stretch the fabric for that to happen. Chances are you won't be stretching it to that extent during construction. If it turns out you are working with the a fabric that runs easily, you simply need to handle it with care and perhaps stabilize the edges. But let's get back to the act of cutting. 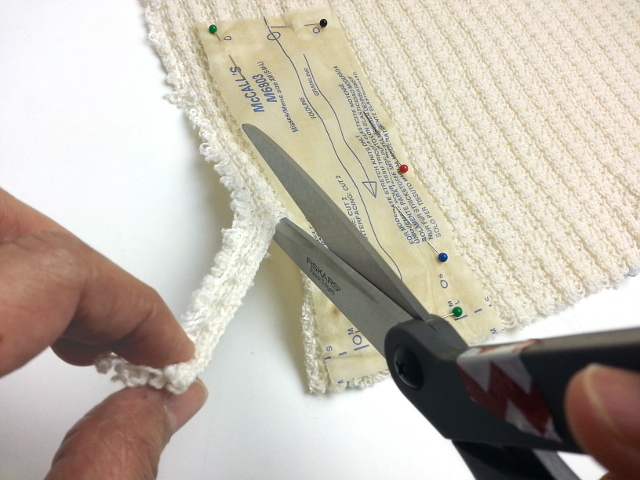 The basics of cutting a sweater knit are similar to those for cutting woven fabrics. My favorite cutting tool is pictured above, the Black & Decker electric scissors. This wonderful tool has been discontinued, as I've mentioned previously on this blog. In its day, this hard working tool was really inexpensive (about $15) and it cut through sweater knits extremely well. The WBT1 Electric Scissors have been recommended to me but I haven't tried them yet since I still have one pair of the B & D's in working order. The learning curve is surprisingly gentle with electric scissors, and I find them easier to use than rotary cutters or manual shears. Since I’m trying to preserve my B & D’s, I save them for cutting lengths of fabric. I use a rotary cutter now for pattern cutting. 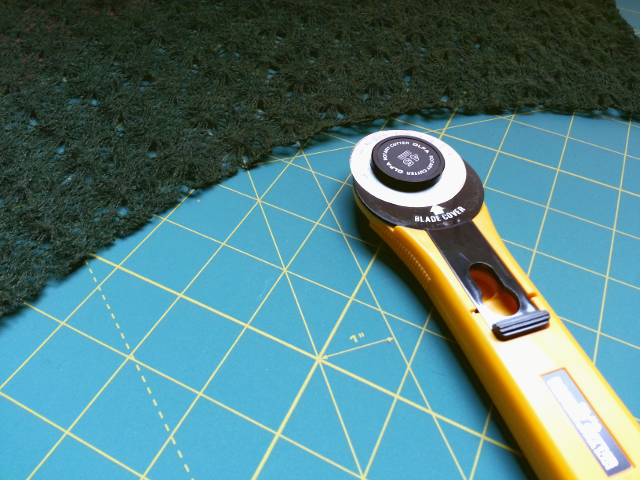 A rotary cutter works well, with practice, but remember -- a sharp blade is mandatory! My least favorite cutting tool has always been dressmaking shears! My current pair of bent-handled, “knife edge” Friskars (Amazon affiliate link), however, can easily slice through even the heaviest sweater knit. Here are the important things to remember, when using shears: Always keep the bottom blade gliding along the table as you cut. With each cut, follow through to the tip of the blades to avoid jagged edges. I'm right handed so my left hand does whatever it takes to help keep the sweater knit fabric under control while I cut. It could be holding the cut-away fabric firmly on the cutting table or gently supporting a narrow strip away from the pattern piece I'm cutting. You may need different techniques, depending on which part of the pattern you're cutting. Whichever tool or tools you use, they must be sharp or the they'll chew up the fabric or stretch and distort the edges of the pattern pieces. I'm always on the lookout for other tools and tips, so please recommend any favorites you have. All right then, no more fears! Need tips on sewing sweater knits? Download my Roadmap for Improved Sweater Knit Seams.